Note: I'm not sure if below shortcut is correct. It's listed in Microsoft's documents. Please let me know in comments if you know the correct one. then Ctrl + Shift + P: If the current bookmark is in a folder, moves to the next bookmark in the folder. Bookmarks outside the folder are skipped. If the bookmark is not in a folder, moves to the next bookmark at the same level. If the Bookmarks window contains folder, bookmarks in folders are skipped. Display the Navigate To dialog box. SQL Server Management Studio (SMSS) is an integrated environment for managing any SQL infrastructure. It allows you to manage, configure and develop components of SQL Server, Azure SQL Database, and SQL Data Warehouse. 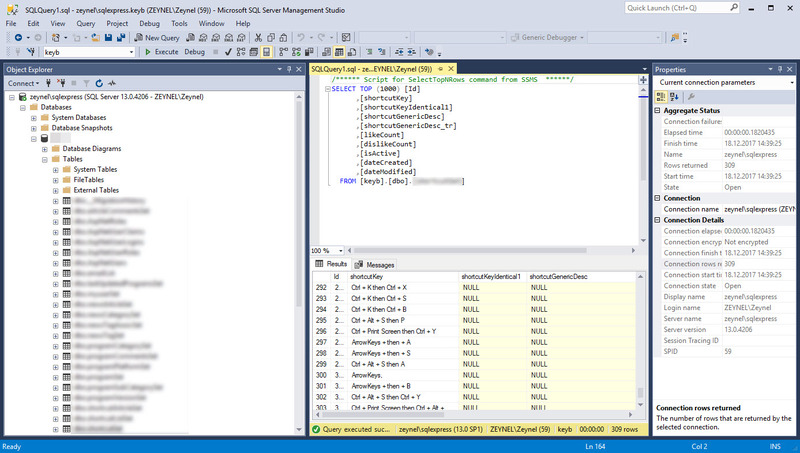 What is your favorite SQL Server Management Studio (SSMS) hotkey? Do you have any useful tips for program? Let other users know below.